Somewhere in the world, a car dealership is selling a brand new vehicle as you read this. This vehicle may not have all of the accessories that the customer wants and may be headed to your shop next for the installation of ComfortHeat seat heaters, a RearSight backup camera system, DashCam system for recording on-road driving or myriad other aftermarket add-ons and you'll be tasked with locating a stable 12-volt power supply on a vehicle you have never seen before. Installing any aftermarket 12-volt accessory in a boat, car, truck, RV, tractor, or motorcycle can be a difficult experience. Finding the correct wires can be costly and can potentially damage critical interior components and electrical systems. If these accessories are left on - accidentally or deliberately - these accessories can drain a battery dead. SourcePWR Plus eliminates the stress that comes with installation aftermarket accessories such as radios, navigation systems, lighting, trolling motors, radar and communication devices. 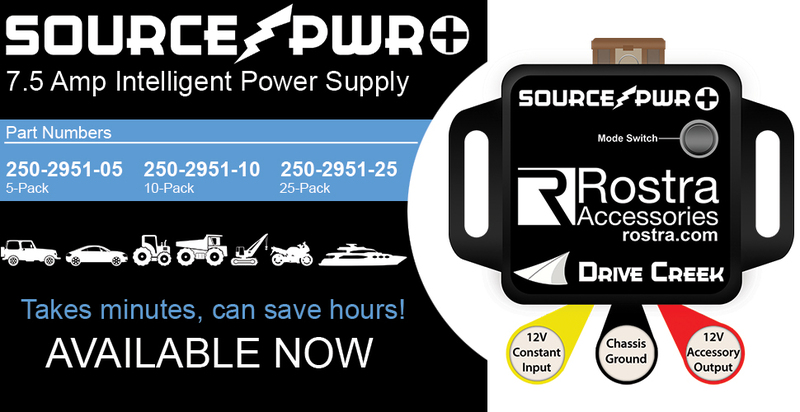 With two programming modes and three distinct features, SourcePWR Plus will save time and money while maintaining proper battery voltages. With a rugged, water-resistant construction, SourcePWR Plus is small enough to fit in the palm of your hand and once connected it can be discretely hidden away. Function 1 - Consists of the basic function of the original SourcePWR. After connecting the +/- inputs, SourcePWR Plus creates ignition power for your accessories with the engine running and turning power off with the engine is off. SourcePWR Plus has an internal LED which illuminates the fuse when power is on and the engine is running allowing for a quick and easy set-up and diagnostics. Function 2 - Provides the added benefit of a programmable delay for power-off. Customers can determine how long power is extended to their accessories by choosing up to 90 minutes in program mode. This feature is great for mimicking CAN BUS shut-down time and creating a retained accessory power (RAP) circuit/feature - ideal for vehicles equipped with Start/Stop technology. Function 3 - Is “battery saver” mode. Devices will power on with the engine but stay on when the engine turns off. This mode will continue to deliver power to the accessory until the battery voltage reaches 11.5 volts. Customers can enjoy this feature by leaving accessories on such as radios, trolling motors and DVR dash cameras without the worry of completely draining the battery.